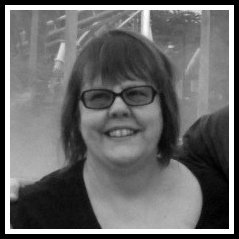 Blog Quick Quotes: Introducing... Donna Coughlin! Hello! Let me start by saying I am so honored to be back on the design team here at Quick Quotes. 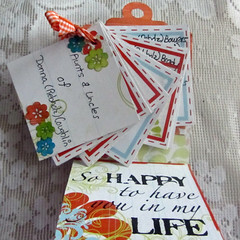 I’ve been on some wonderful design teams throughout my scrapbooking career, and Quick Quotes is certainly the best. I am looking forward to wonderful year with this new design team. Having scrapped for over 13 years, I still love it as much as the day I began. I love working with new materials and experimenting with new material on my pages. I live outside of Reading, PA with my wonderful husband and I am a mother of 5, mostly grown children, and two beautiful granddaughters. I work full time as an accountant and when I get time I love to travel, especially to Disney, go to antique stores and collecting tins. 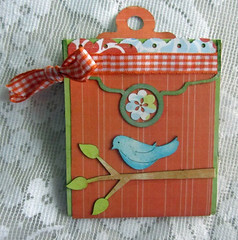 Donna received the January Club Q Kits to work with and has a lovely project to share with us. Wow, what a way to start of my first month with Quick Quotes! The Club Q kits are beautiful and so versatile. Let me tell you a little bit about my project. With the passing of my mother my son had lots of questions about all my aunts, uncles and cousins he met at the funeral, many for the first time. 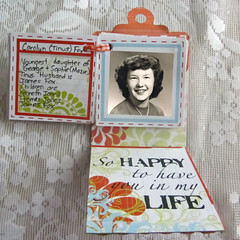 So, I made this cute little mini album using a combination of two of the January kits, the Premier Altered Kit and the Premier Page kit, and the Quick Quotes Limeade and Blue Hawaiian Powder Puff Chalk Inks. 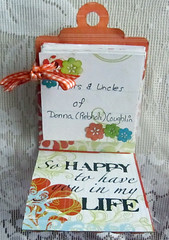 Each page has an aunt or uncle, with the names of their spouse and children. The front cover I deconstructed a lot of the parts in the two kits and used some of the die cuts included in the kit and used Powder Puff inks to color them. These inks match the kit colors perfectly. The bow on the ribbon also helps keep the book closed. The kit contained a perfect sheet of paper that had 3x3 inch squares that I cut out and glued back to back. I punch a hole in the corner and used the ribbon from the kit to tie them all together. Here is what one of the pages looks like on the inside. I hope you enjoy this mini album and drop me a line if you make one too, I would love to see it. Please give Donna a big warm Quick Quotes welcome back!!! Welcome back Donna!! I love your mini. Its a wonderful keepsake. What a beautiful memory of your mother and a wonderful keepsake for your son. Your project is gorgeous!! Welcome back Donna! Your project is such a great idea for this kit and for your Son! I am excited to work with you Donna! Your first project is spectacular! What a nice tribute to your mom. I look forward to working with you, Donna! This is such an awesome project to hold some special memories for your son. Congrats donna on making the team! That is really a cute project. Thanks for the inspiration.